Find out how some small changes to key mechanics have made Mass Effect 3′s Infiltrator class and her cloaking device essential to any N7 squad. Cloaking devices are often such selfish gadgets. What benefits do your allies receive from you turning invisible in order to get the hell out of dodge? If they’re lucky, a few more enemies focusing attention on them. If they’re unlucky, a swift demise. But this isn’t the case for cloaking devices in Mass Effect 3. 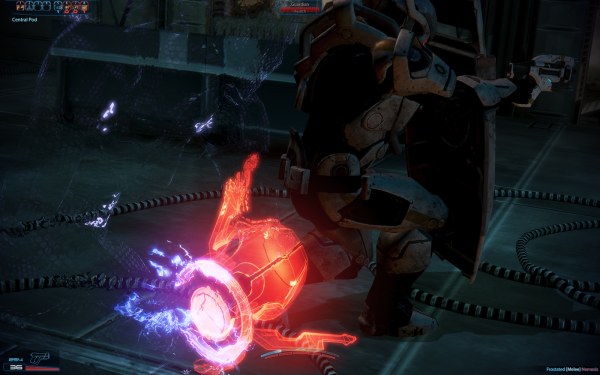 The Infiltrator class’ unique ability to temporarily bend light around her N7 armour has progressed from being a thing of utter uselessness in Mass Effect 2, to one of the most valuable elements of the Systems Alliance’s crack strike teams. A sniper rifle is a natural fit for the Infiltrator; her cloaking device allows her to easily reposition to optimum firing range. Which is somewhere far, far away. Shuttle-dropping into any of Mass Effect 3′s multiplayer horde mode hot-zones with an Infiltrator in your squad will save your life. 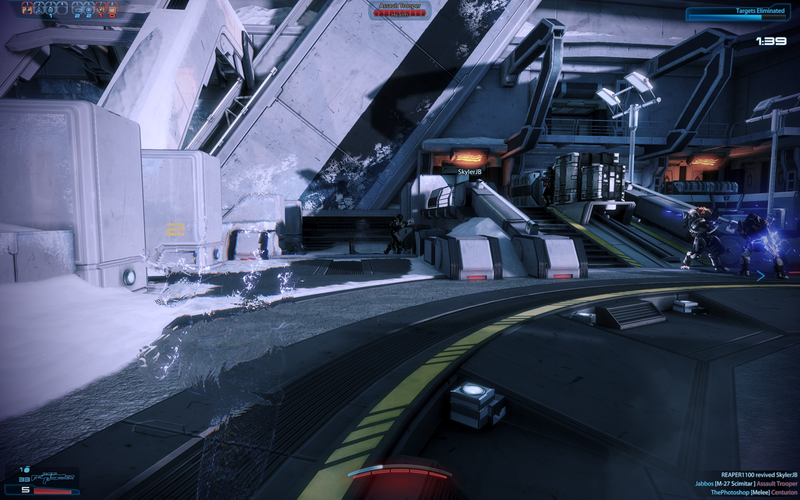 The design of Mass Effect 3′s multiplayer levels, combined with the swift and all-encompassing nature of enemy reinforcement waves, makes getting overwhelmed an inevitability. Your squad will break. You will scatter. And when that Atlas mech stomps around the corner and cuts you off, you’ll have no recourse but to cop its instant-kill missile to the chest plate. But if that Infiltrator is you, then you will always be the last one alive when all others have fallen. You will be the last one alive when all others have fallen. Your squad mates are on the ground, dying, desperately mashing spacebar to prolong their lives a few seconds more. It’s this situation where the Infiltrator shines. Her cloaking device allows her to interact with the environment without losing her shimmering, stealthy visage – something new to Mass Effect 3. This means she can get up close to her squad mates’ limp, near-lifeless bodies and crouch down to manually revive them (no MediGel required!) whilst the enemies have stomped off to find someone else to kill. And all without attracting their attention all over again. We’ve played numerous rounds where our Infiltrator was the last woman alive; systematically working our way around the map whilst cloaked and reviving our team mates, one by one, got us through to the final wave. While her buddies are fighting the good fight, this Infiltrator is getting the actual job done. The benefits of cloaked interactivity don’t stop there. Every so often, Mass Effect 3′s multiplayer mode throws a spin on the next wave of enemies; an objective that must be completed along with the bag guys’ destruction. One of these missions involves running around the level and activating four security consoles in sequence. They take quite a while to enable, and the whole time the squad member activating them is crouched over the terminal, unable to defend themselves. But, yes – you can activate the terminals whilst cloaked. The enemy won’t bother you. Fully upgraded, the cloaking device’s duration is exactly the same as the time needed to activate a terminal. Are you seeing the connection yet? The Infiltrator class is perfect for this particular mission objective – whilst the other three squad members engage enemy forces, she can run across the map and rapidly activate each console in sequence. All whilst remaining cloaked, and unhindered. It’s so good, that it borders upon an imbalance. Enjoy those time-bonus credits, gents. 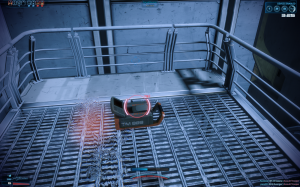 Speaking of upgrades, the cloaking device can also be upgraded to increase melee damage whilst cloaked. This applies to the Infiltrator’s new omni-blade: a heavy melee attack of hard light construction that, when fully upgraded and used in conjunction with her cloaking device, gives the Infiltrator the veritable ability to backstab. This is particularly useful for certain enemies that prevent ranged combat, like the Cerberus Nemesis snipers, or enemies who prevent frontal attacks, like the Cerberus Guardian and his riot shield. Cloak, get behind them, and give them a taste of omni-death. This is what backstabbing people in the future will look like. Confused about hard light? We suggest a season of Red Dwarf. All of these points apply to Mass Effect 3′s singleplayer as well. But the resolutely linear nature of the levels and combat arenas makes their use less essential. 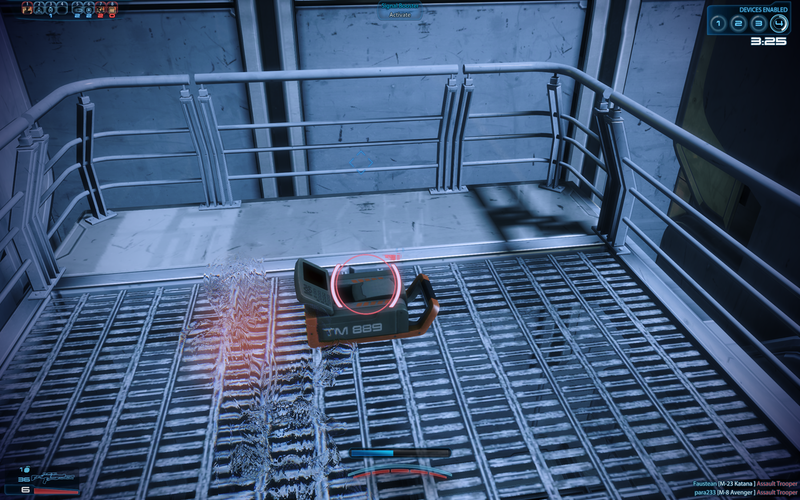 So it is in Mass Effect 3′s multiplayer mode that stealth becomes not just viable, but crucial to survival. It’s amazing how a few key changes, like manual squad mate revives, can transform a once-useless cloaking device into something so critical. Combined with the cloaking device’s use in particular objective waves, and the Infiltrator has become, more than anything, a valuable support class for the strike team. Stealth and selfishness were once two halves of the same coin, but when shimmering shadow picks you up from near-death, you know who’s buying the first round back on the Citadel. Just how successful was BioWare in its addition of a stealth section to the final DLC for Mass Effect 2? The most interesting about the Infiltrator class is that, while Bioware frames each class as having a specific combat role, its cloak makes it one of the most versatile. That kind of close-quarters hit-and-run tactic is perfectly viable with the cloak, even when the more advanced class bonuses encourage you to improve the sniper rifle; that said, you could just as easily play a guns-blazing soldier with a backup plan for when you’re surrounded. And on top of that, Infiltrators have ammunition that’s effective against shields and a special attack which does extra damage to armor. There’s no situation where an Infiltrator will find him- or herself completely unprepared, and no other class lets you shift tactics and exploit enemy weaknesses to the same degree.